Yorkshire history, heritage and places to visit. Part of England's North East. Yorkshire is a distinct region in itself forming a vast corner of North Eastern England that was historically the largest county in England. Despite its geographical location in the North East it is not usually included as part of ‘North East England’. The England’s North East site includes a number of pages featuring Yorkshire and particularly North Yorkshire but our main emphasis continues to be the historic counties of Northumberland and Durham including Tyneside, Wearside and those parts of Teesside north of the Tees. There are many historic links between the two regions dating back to Roman times and the Kingdom of Northumbria. We include pages on Yorkshire for completeness. There is much shared heritage, culture and landscape history between the two regions. In addition many places in Yorkshire are within easy reach of the North East, for example Wenslyedale is as near to Newcastle as Newcastle is to Bamburgh so from a visitors’ point of view or from the interest of days out it makes sense. North Yorkshire alone is now the largest county in England in terms of area while Yorkshire as a whole is a vast and varied region of more than three and a half million acres and a population of almost 5 million. That’s more people than Norway. Indeed, Yorkshire’s population is larger than Wales or Ireland, or New Zealand, or Albania, Lithuania, Estonia, Jamaica or Iceland. It is not far behind Denmark and there are almost as many Yorkshiremen as there are Scots. Indeed more than 28 of the states of America have a population that is smaller than that of Yorkshire. Most of Yorkshire’s people live in the south and south west, in the old West Riding. Here we find many of the region’s largest towns, most of which grew as a result of the historic textile trade. This is home to Leeds, Bradford, Halifax, Huddersfield, Wakefield, Pontefract and Castleford to name but a few, accompanied by Rotherham, Doncaster, Barnsley and Sheffield in the old mining and steel making districts of the south. Remarkably for such a populous region, most of Yorkshire still forms one of the least densely populated corners of the nation. It is home to vast swathes of unspoiled, beautiful countryside, littered only with picturesque villages and genteel towns. Yorkshire’s smaller places range from solid stone hamlets in the dales, fine brick-built coaching towns in the vales to lovely red-roofed cottages in captivating coastal settlements that hug the coves of the shore. We have the refined towns of Harrogate and Ilkley, the stately seaside resorts of Scarborough, Saltburn and Bridlington, the historic ports of Hull, Goole and Middlesbrough. Here too are towns of ancient strength, the fortified castle towns of Richmond, Knaresborough and Skipton. There are ancient cathedral and abbey towns like Selby, Beverley and Ripon and to top it all we have one of the most historic cities in England in the shape of the wonderful City of York. It is the countryside, though, for which Yorkshire is best known. 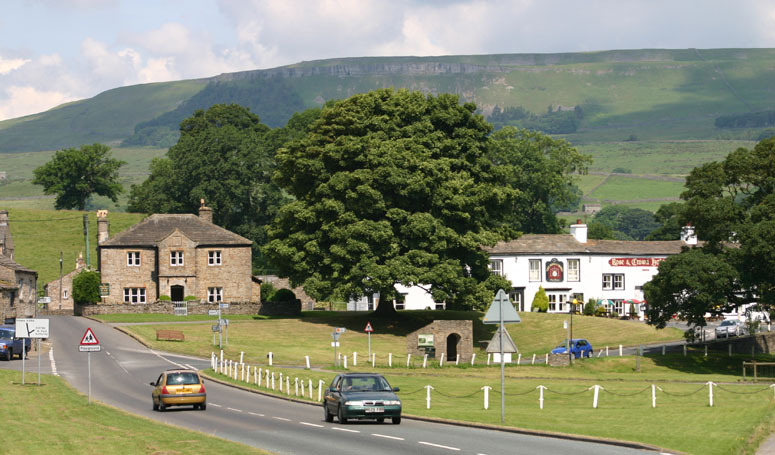 The beautiful Yorkshire Dales in the Carboniferous Pennines of the west attract visitors from across the land. They come to walk, to stroll, to browse in bookshops or relax with a pint of Yorkshire’s finest ale. They come in search of waterfalls, ruined abbeys, captivating views and literary links. The abbeys, viewpoints and smaller, more intimate dales of the North York Moors are equally fine in the Jurrassic country to the east. The big difference here is that we have the added bonus of the coast. At Whitby we find it all – the ruined abbey, the dale of the Esk emptying its waters into the sea, the scenery, the history and the fish and chips. At the heart of the Yorkshire region, running through its centre we find the open, flatter country of the Vale of Mowbray in the north and Vale of York in the south. Here the Pennines lie to the west, with the North York Moors to the east, both forming distant, but ever-present backdrops to miles of richly cultivated farmland only broken by leafy, red-brick villages or Georgian coaching towns. Near Thirsk the vale is almost joined by a third vale – the Vale of Pickering. It lies to the east, beyond the gentle climbs of Coxwold and the Howardian Hills. The Vale of Pickering slides neatly and subtly beneath the southern slopes of the North York Moors almost reaching the sea in the form of the marshy Carrs just south of Scarborough. Pickering’s vale plays host to the historic towns of Malton and Norton in the vale, while other towns like Helmsley and Pickering itself, nest on the moor edges of the vale’s northern flank. The Vale of Pickering is the dividing line between the North York Moors and the more modest hills of the Yorkshire Wolds in the old East Riding to the south. The historic East Riding of Yorkshire corresponds closely to the county known by that name today and it is one of the least known and most sparsely populated parts of Yorkshire. Here heading south-east over the lovely but largely empty wolds we reach the flatter lands of Driffield, Beverley, Hull and Holderness near the banks of the Humber at the very southern reach of Yorkshire’s ancient terrain. At the most easterly point in Yorkshire we land at Spurn Head, the little finger of Yorkshire’s great welcoming hand, where Yorkshire battles with the sea to keep possession of this very tiniest stretch of Yorkshire land. If you live in Yorkshire I hope that you will enjoy finding out more about the fascinating region in which you live and if you don’t, well hopefully you’ll nurture a desire to explore a region that was historically part of the Kingdom of Northumbria, the land north of the Humber.